His car pulls into the driveway. He shouldn’t be home yet. I am in the bedroom readying myself for dinner for twenty-eight at our home in a little more than an hour. I meet him outside the front door and he escorts me back into the bedroom. “They have decided not to renew my contract.” Disbelief. Confusion. Shock. And our lives are turned upside down in a moment. And sometimes, that’s how life happens. A phone call. An email. A knock on the door. An interruption. And life has changed in an instant. But looking back, by God’s mysterious grace, I was prepared. On my desk sat a little piece of hand-made pottery, a pinch pot, from the Facilitator’s Retreat last spring. The word scratched into it - TRUST. And I open my journal and find the two words God gave me at that same retreat in response to the question, “What is God wanting from me?”- UNRESERVED SURRENDER. And I am reminded of conversations with Molly and Leslie of how to find a deeper trust, how to surrender wholly. God knew our lives were about to be interrupted even before I could comprehend what I would need to carry me through. That is how he works, isn’t it? Giving us tools for the journey before we know we need them? Preparing us for what is to come when we can’t even imagine the scenario? This past year did not turn out how I had planned. Frankly, it seldom does. No one plans this kind of interruption. But God began preparing me well before it came. I pulled out the My Life Story map in preparation for a women’s retreat I am facilitating in April. I look and see God’s hand in my life, graciously preparing me for the plan he has for me; giving me the tools I need; crossing my path with the people I need to journey alongside of me – for the long haul or for a two-day retreat; showing me, often one step at a time, where to place my foot. So I keep my heart ready in case one of God’s interruptions shows up today. I know he has given me all that I need to handle it. 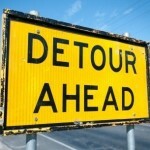 In what way has God prepared you for the interruptions that have come your way? What has he been inviting you into, lately? Who might God want you to walk along side and encourage as they live a life interrupted? Oh Lord, I sit with my hands open toward you inviting you to come with your interruptions - your plan for my day. What is it today, Lord, that you might invite me to live into? Who is it that you might prompt me to call or see? Open my eyes as I venture out today to have your sensitivity to those around me and how you are interrupting their lives. Give me words and actions and ears to handle that which you will put in front of me. Thank you for loving me so much that you are willing to interrupt me out of my selfish plan into your holy plan. Amen.